Product prices and availability are accurate as of 2019-04-19 06:20:49 UTC and are subject to change. Any price and availability information displayed on http://www.amazon.com/ at the time of purchase will apply to the purchase of this product. 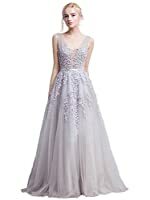 FeliciaDress is a professional gown manufacturer. We dedicated to making dresses over 10 years and promise to provide good quality products to all of our customers. We are committed to constantly expanding our product selection and bringing you the latest and greatest dresses. FeliciaDress accepts most returns within the 15-day. 1. Products that have exceeded the 15-day. 2. Products damaged due to customer negligence like improper assembly or usage, obvious man-made damage, etc. 3. 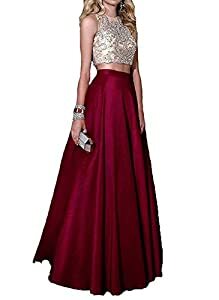 Damages such as holes and some unperfect details such as excessive thread ends that do not affect the overall use of the dress being discovered after the dress has been worn. 5. Problems are caused by yourself such as wrong size choosed or wrong color selected. All the colors of this prom are decorated with Sliver Applique. The real color of the item may be slightly different from the pictures shown on website. The fabric: Taffeta and Beaded. Features: Two Pieces, Floor Length, Beaded, Ruffles. We can accept for Custom Made dress. So u can send me the Exact Measurements about your Measurement details. Please tell is your Bust, Waist, Hips and Height by Email. We will custom made for u ASAP. (Please check carefully at the size chart and measuring guide on the LEFT, NOT the Amazon size chart). You need to pay 20% of the the price of the dress. Size: Standard size, customized size needed please contact us. There has Two Shipping Options : 1. The Expedited Shipping which will take 3-4 days to be delivered. 2. The Standard Option will take 12-15 days.